Maintaining the performance and integrity of modern glazing and glazing systems presents an increasingly complex and demanding set of challenges to building owners and managers. Our team of surveyors, project managers and fitters have over 25 years of construction, glass and glazing experience in our specialist field. This gives us the skills and understanding to deliver solutions that are innovative and creative, but above all safe, practical, feasable and appropriate to our clients’ requirements. 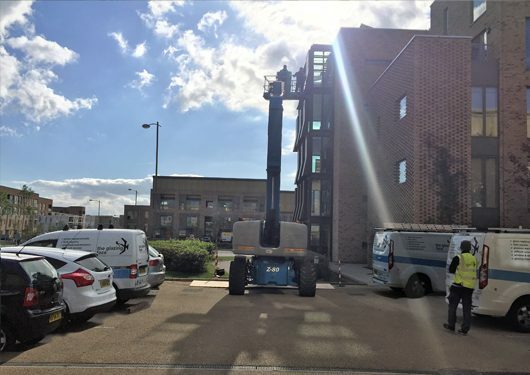 Our working practices are constantly reviewed and upgraded and we are proud that these and our Health & Safety procedures are accredited by Achilles, Alcumus (Safecontractor), CHAS, ContractorPlus and Constructionline. In addition, Quality and Environmental Quality Management procedures across the company are ISO 9001 and 14001 certified. Fortunately I had a structural survey locally [to site] last week and popped by the site and the workmanship looks good. I know LCN are happy [with the works]. Thanks for the update. The Glazing Face have provided a professional service with all works meeting required H&S requirements of site. Good communication throughout work with prompt responses to any queries or issues that popped up as they tend to. I would recommend using and would use The Glazing Face again myself. Good news! To date, we seem to have combatted the issue from the roofline, so I thank you all for your persistence in solving this for us, it’s very much appreciated. Will you thank your team for me, they were all great to work with! The Glazing Face have been awarded the contract to carry out remedial repair and alteration works to a 5 storey high profile commercial building situated on the riverside outside to Temple Meads train station. The tenants of the building are Burges Salmon who are a reputable law practice who insist on high quality workmanship. As this project was a legacy project, we employed The Glazing Face due to their specialist expertise in this field. In meeting TGF team, they gave an immediate positive reaction to the works, and were not fazed by the extent of the works ahead of them.